Solarez SUP Travel Repair Kit - FREE SHIPPING! Solarez SUP Travel Ding Repair Kit - FREE SHIPPING! The new Solarez epoxy SUP Travel Repair Kit is everything you need for a professional SUP repair. 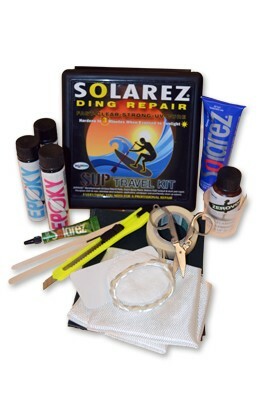 This kit includes a large tube of Solarez UV-Cure epoxy, Solarez traction pad repair (also good for wetsuit repair), 2-part epoxy resin (great for paddle handles and fin box repair), acetone, fiberglass cloth and rope, razor knife, scissors, sandpaper, masking tape, applicators, and a mixing cup!